As you drive through the village of Crowthorn with its luxurious homes and lush landscape you arrive at Greystokes. Through the electric gates, you will pull into the sweeping driveway and step out of your car to be totally seduced by the views that surround you. 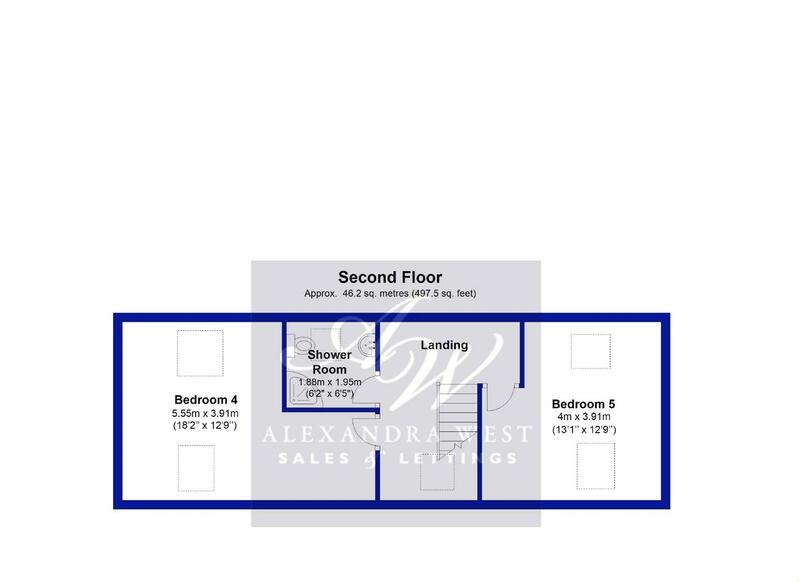 The ground floor rooms flow easily around the central hallway, there is a large utility just off the hall, handy for all those muddy boots and wellies when you have been out enjoying the local walks. There is also a downstairs loo just through the utility room. On the ground floor there is a lift, should you have a family member or guest that needs assistance. Its also handy for carrying all the washing downstairs or getting to bed after sharing a bottle of wine on the terrace whilst watching the sun go down. 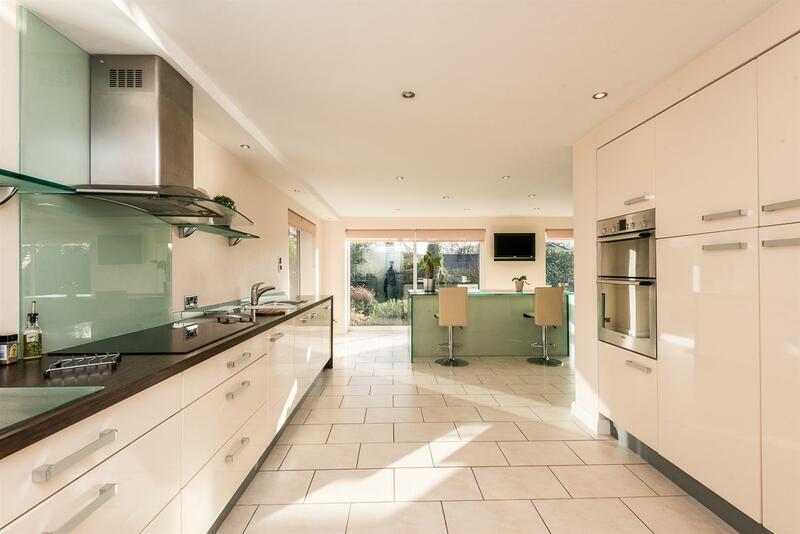 The kitchen is sleek and practical with its gloss units and drawers, built in appliances and Granite surfaces. 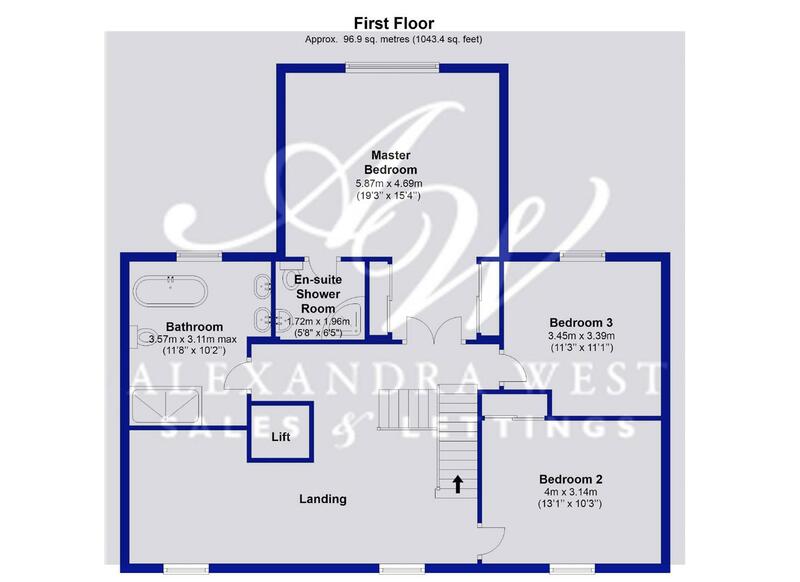 The dining area is adjacent to the kitchen and is open plan to the relaxing family room. Double doors open to both sides of this room which make it beautifully light and easy to make the most of the various seating areas when you decide to dine Alfresco or are entertaining friends. If you want even more space simply slide the concealed wall back and you reveal the formal lounge and make an amazing big space. If you prefer separate rooms simply keep the wall closed and enjoy a cosy night in front of the log burner. 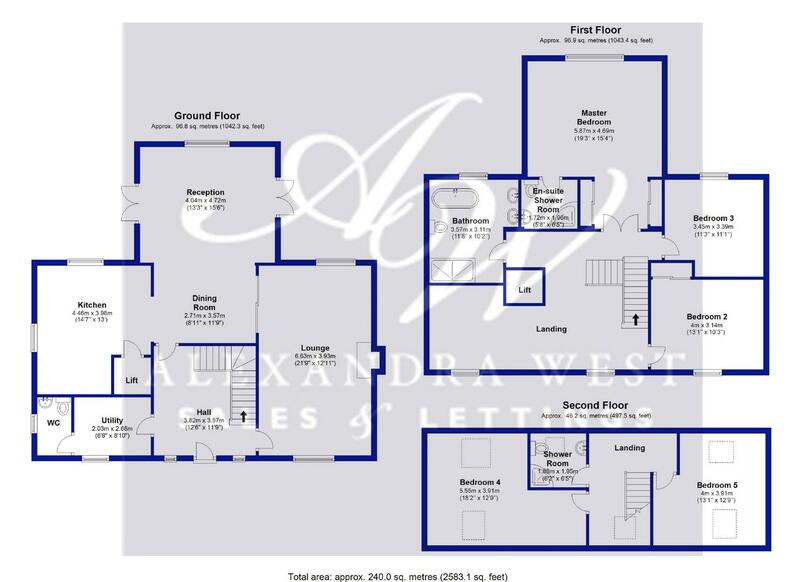 Take the first flight of stairs and arrive at the lovely big landing area which has an open study, this was planned to be partitioned off into a separate room but our clients love the open plan feel and it works brilliantly. Double doors open onto the master bedroom which takes full advantage of the incredible views. Fitted furniture makes everything seamless here and there is a large en suite shower room with a multi-function shower. The house bathroom with underfloor heating is the idyllic retreat with its twin basins, large walk in shower and luxury bathtub to de-stress after a long day. 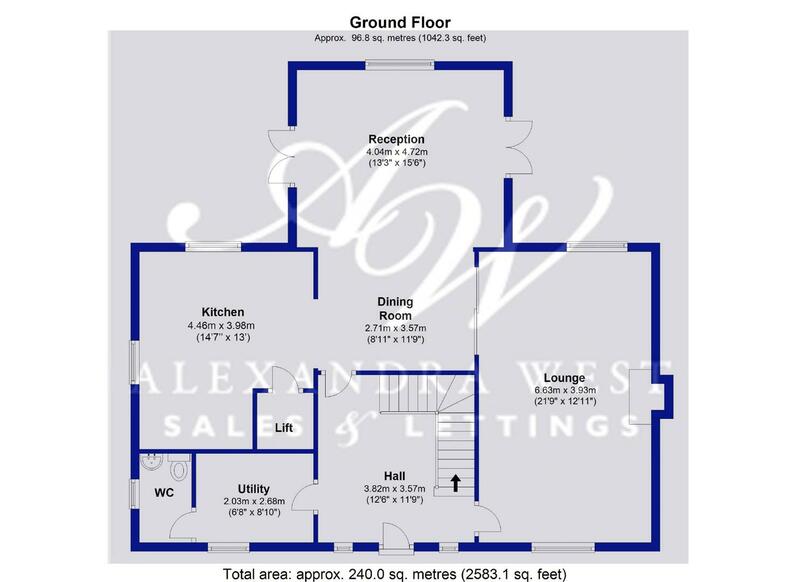 There are two more double bedrooms on this floor, one with built in wardrobes and as you take the second flight of stairs you will find two more double rooms and another shower room. The flexibility of this house is immense, the kids would love this floor all to themselves! We have mentioned the parking, the garage and the views but we haven't yet mentioned the fabulous gardens. There are patio areas to dine from, a decked terrace to sunbathe on, wide planted borders to admire and lawns so well-manicured they're almost too good to be true, well, we will let you into a little secret.... Its artificial grass! and with weed proof membrane under all of the flowerbeds this is such an easy garden to maintain leaving you to soak up the surroundings and spend your time enjoying the setting of this fabulous family home. In the 1800's a wealthy mill owner bought a run-down pub on the outskirts of Edgworth village and donated it, along with 80 acres of surrounding land and £5,000 in order to open the first National Childrens Home outside London. Various buildings were erected and the village of Crowthorn was born. The school closed its doors in 2002 and the buildings were sold and this unique village has been transformed into an impressive residential development and what is arguably one of the most idyllic settings around. Greystokes was built in 2010 on the grounds of the matron's bungalow which was demolished to make way for this impressive three storey property which takes full advantage of the breathtaking views that surround it. 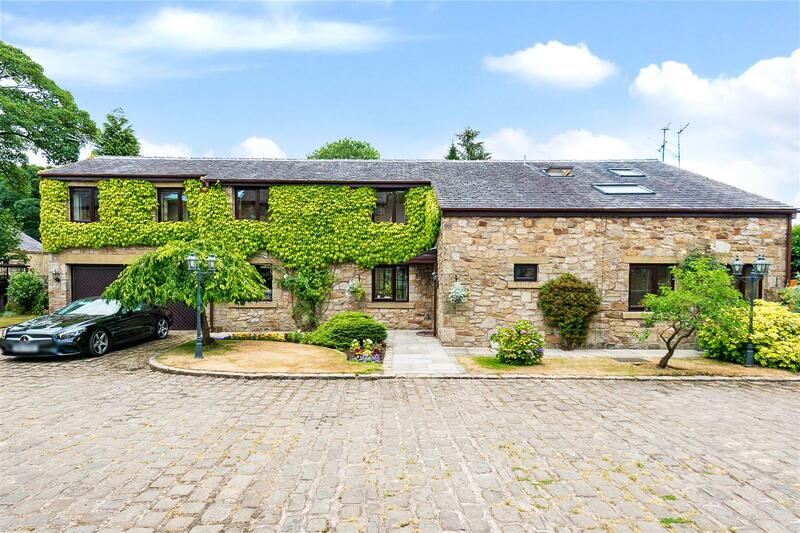 Moorside Road is a tranquil location that gives you the feeling you are 'in the middle of nowhere' yet you are within very easy reach of the motorway network with the M65, M66 and M62 just a short drive away so you certainly get the best of both worlds. You have the local amenities of Edgworth to hand with the primary school, shops, post office, doctor, pubs restaurants and the most amazing walks! Gas underfloor heating throughout the ground floor and first floor. Mains gas, mains water, mains drainage.